Location was great and the hotle is one of the fancy hotle and near by lots of atractions area in San Diego I got everything I like expect one thing is the bed was small for 3 people in the room they have buble bed insted of queen, however other then that it was great over all and enjoyed the stay there I would love to go again. The overall experience was great. The staff was very accommodating and nice. The only complaint was the quality of the restaurants and food. Room service was very disappointing. The location, price and overall appearance. The Room service was very superb. It was a nice luxurious hotel. Prices for things were unreasonable, exaggerated to say the least. It's not so much we couldn't pay for it, it's just ridiculous to pay 3.50 for a small bottled water when you can get if around the corner for 50 cents to a dollar. We usually go with Marriott, the Marriott we usually stay in San Diego, charge 10 bucks for parking, but we get a free full breakfast every morning, twice as nice rooms with kitchens and bedroom, great location close to everything and yet very quite. Hate the Hyatt! It's ridiculous! But if your rich, don't mind what you spend then this hotel is for you. There was a fee for everything, small bottled water was 3.50, self parking $20 fees. Stay at the Manchester Grand Hyatt if you want to make the most of your San Diego vacation. Each day can be spent exploring many popular sites and you wont be wasting any time getting there. 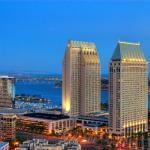 It is close to the San Diego Zoo, the Gaslamp district, Seaport Village and San Diego Zoo. It is also near many fantastic beaches. If youd rather lay low you can relax at its lovely spa. Or, enjoy the view from your hotel room and map out the adventures for the next day. Each room at the Manchester Grand Hyatt offers your basic hotel needs. There are computer hook ups, hairdryers, coffee makers and mini bars in each. Plus, each room also has air conditioning, which is a must for California. Those who simply cant tear themselves away from cooking can also book suites that have a kitchenette. Soak up the San Diego sun at the outdoor pool and sundeck. You could also get into bathing suit shape at the gym or indulge at the amazing spa. The massages, facials and body polish treatments are fantastic. But of course, the attractions located outside its doors attract most guests to the Manchester Grand Hyatt. Take advantage of the fantastic bike trails for a unique look at what this city has to offer. The location alone makes it worth your while. Staying here allows you to take advantage of the nearby sites. You wont have to go far to try out some of the very best restaurants San Diego has to offer and the walk to and from the hotel is quite nice. But remember, you are paying primarily for the location. Although the hotel itself is quite nice the cost per night reflects its prime real estate.